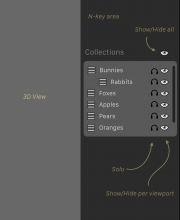 In Blender 2.8, we have introduced the concept of Collections to replace the old layers system. Users can set up their Collections in the Outliner. They can name them, structure them and organise them there. For these reasons, we don't want to re-use that interface in Blender 2.8. This will allow users to show/hide or solo collections. For now, we probably won't allow renaming or re-ordering here. This is just a quick way to show/hide collections. You can already use the M-key in 2.8 to move items between Collections. 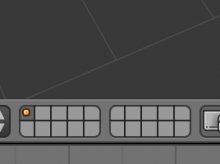 This is replace the old layers in the header. It could also be a popover, but maybe we should support that in a more general way, so that any panel in the N-key are can become a popover if you don't want it persistent. If we ever do that, it will probably happen sometime later. 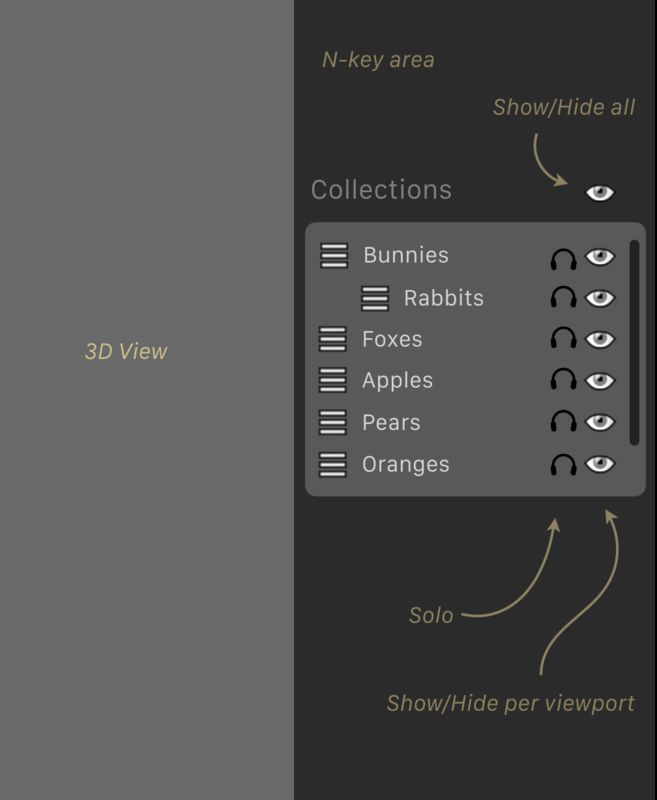 Many users are concerned about the ability to switch between what we at the moment know as layers - in the future collections - in the viewport using hotkeys. At the moment, you can use 1, 2, 3, Alt+1, Alt+2, etc to quickly show and hide layers. Do you think it would be possible to implement something flexible into your design approach? When I look at your mock-up, it makes me think if it was possible to simply assign a hotkey to them, defined by the user. That way, you would not need to hard-code stuff in, instead you put the responsibility to assign the desired key-stroke to the users. Replaced by T57857: Collections, objects visibility and local view.